Unique handmade jewelry for all occasions. Special Bridal Promotion: The first 2 brides who place an order with me for their bridal group will receive a special discount! Please contact me for more information!! Most orders take 3-5 business days (Monday-Friday) before shipping. Please contact me before placing your order if you need your item(s) in less than 7 business days. That way, I am aware of your time frame. There will be a Rush Fee and we may have to upgrade the shipping. If you're placing a bridal order, please place your order a minimum of 4 weeks from the time you need it in hand. This will give the order a better chance of reaching you in time. Beautifully made and very fast shipping! Just what I was looking for to leave on for the whole month of February even! I’m extremely pleased! Thank you so much!! I began making jewelry when I realized that I wanted jewelry that was both unique and personal. So my wonderfully supportive husband and I went directly to a craft store and purchased all the basic tools and materials I would need to start and I haven't stopped since. 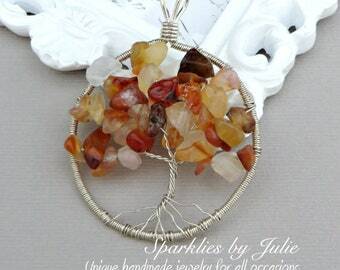 With much encouragement from my family, Sparklies by Julie was born. Today, I enjoy selling my wide variety of sparklies to customers from all over the globe. I offer hand stamped and personalized jewelry as well as wire wrapped and beaded designs. My preferred materials are sterling silver or gold filled metals, semi-precious gemstones and Swarovski Crystallized elements. 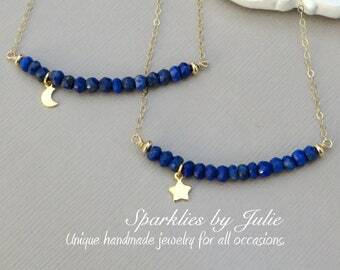 Sparklies by Julie has been a wonderful creative outlet for me. I couldn't have made my shop as successful without the support of my awesome family, friends and clients. I hope you will visit often to see what new sparklies I've come up with.	. I am a stay-at-home Mommy to two wonderful little boys and wife to a very supportive husband. I hand make all the items in my shop in my spare time; mostly using sterling silver, semi-precious or precious gemstones, & Swarovski crystals. Hello, and thank you for looking at my store. I am a stay-at-home mom of two energetic little guys, who took up jewelry making as a hobby. I've always loved handcrafted jewelry & the thought and care that goes into each handmade item. The items I made just kept piling up on my desk and on my shelves in my craft room. 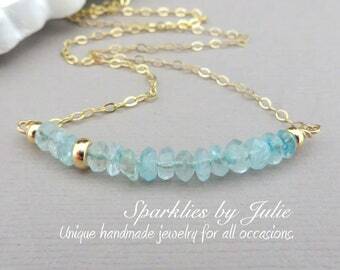 Many people liked my items so much that I decided to open up my own little store and so Sparklies by Julie was created in 2008. I sold in my own little shop for 2 years, then transferred everything over to join the Etsy community. All the items you see are handcrafted by me in my spare time, and some are one-of-a-kind (OOAK). My preferred materials are Swarovski crystal elements, semi-precious/precious gemstones, sterling silver and gold filled. I love offering a wide variety of beautiful jewelry, from hand stamped & personalized, to wire wrapped, to beaded. If you have any questions, feel free to contact me via Etsy messages, it is the best way to reach me and I'll be more than happy to answer. Thank you for your interest, I am honored that you stopped by. Have a wonderful day. Please make sure you read the item descriptions & look at all the photos very carefully before purchasing. I do my best to provide accurate descriptions and clear photos, but the photos may make the items larger than they really appear and sometimes different screens have different resolutions, making the colors a bit different than they actually are. Please contact me via Etsy messages if you have any questions about the color or size of any item. 1) Please contact me within 14 days of receiving your item. EXCHANGES/RETURNS may be made ONLY if the item(s) is returned in UNWORN condition, with all original packaging, within 30 days of receipt and ONLY after you have contacted me for return authorization. ITEM MUST BE RECEIVED IN THE SAME CONDITION IT WAS SENT OUT IN. 2) NO EXCHANGES/RETURNS will be accepted on any personalized, hand stamped, custom or bridal orders, unless it is defective or faulty, as the item(s) was created specifically for you. 3) If your item(s) is defective upon receipt, please contact me immediately, I will be happy to fix OR replace it. You will be responsible for the postage to send the item(s), with all their original packaging, back to me within 30 days of receipt. 4) If an item happens to break within one month (30 days) from the date receipt, please contact me, I will gladly repair the item at no cost. You will be responsible for the postage to send the item(s) to me. 5) If it is a return, you will be responsible for the postage to send everything back to me in UNWORN condition. You will be refunded the purchase amount minus the shipping fee once the item(s) is received. 6) If it is an exchange, you will be responsible for sending the original item, in UNWORN condition, with all original packaging, back to me within 30 days of receipt. ITEM MUST BE RECEIVED IN THE SAME CONDITION IT WAS SENT OUT IN. You may exchange your item for another of equal or greater value, just let me know first. If you are exchanging for an item of greater value, I will invoice you for the difference. I love happy customers and strive for perfection when fulfilling orders or creating custom orders. Any gemstones I use have been diligently checked to make sure they are free of unnatural flaws or defects. That being said, please understand that all natural gemstones are subject to unique inclusions (internal fractures) that in no way make it a "flawed" stone. Some freshwater pearls are bound to include natural ridges or pits on their surface. These gemstones are just the way nature created them. Payment for Reserved Listings must be made within 7 days of placing your order or your listing will be cancelled. I have a limited amount of stock and while I don't mind reserving items for a short time, I may have other buyers who are interested in purchasing right away. If you require extended time in order to make your payment, please contact me via Etsy messages within 24 hours and we will work something out. I appreciate your cooperation. Do I need a PayPal account to purchase? • No, you don't. You will be redirected to the PayPal site where you can enter your credit card details and choose the "continue without signing in" option. If you have any problems with this, please contact me and I will be happy to help out. First off, let me stress: IT IS THE RESPONSIBILITY OF THE BUYER TO MAKE SURE THEIR ADDRESS IS CORRECT ON ETSY AND PAYPAL. I always ship with Tracking to the address I am given, therefore, I can not be held responsible for any packages that were shipped to an incorrect address provided by the buyer. That being said, if you do find that you have inadvertently provided the wrong address, please let me know immediately. If the package comes back to me, I am more than willing to resend it to the correct address. However, depending on the size of the package, there will be a small charge to cover repackaging, postage and tracking. Please understand that IF the package is on it's way back, it may take some time for the United States Postal Service (USPS) to return the package to me. If the package does not come back to me, unfortunately there is very little I can do. Depending on the item(s) purchased, I may be able to provide you with a small discount towards another purchase. ***CUSTOM FEES, DUTIES & TAXES IMPOSED BY OTHER COUNTRIES ARE THE RESPONSIBILITY OF THE BUYER. *** To All International Customers: Please be aware that your country may impose and collect import fees (such as VAT taxes) on products bought and imported from outside your country. These fees are entirely outside of my control and I do not know when they will be imposed as laws are different for each country. VAT taxes are between you and your government. Any items refused (due to VAT taxes), that are not custom or hand stamped, will be refunded minus the shipping fee, and only once the items have arrived back in the same condition they were shipped in. Please take into consideration the possibility of additional costs when making your purchase decision. I will also not mark items as gifts on the customs forms. Falsifying customs declaration forms in order to help a Buyer avoid these taxes and fees is against the law. Please do not ask me to violate the law. Thank you. All items will be sent out via USPS First Class Mail, which takes approximately 3-5 business days within the US and 2-6 weeks internationally. If you need your order faster, please contact me before placing your order to arrange another shipping method. Most of my items will ship on the 5th business day from the date of purchase. Larger orders usually ship within 2-3 weeks from date of purchase. If you need a faster turnaround time, there will be a $20 fee for RUSH ORDERS and you may have to choose a different form of shipping! If your order is a bridal order, please make sure to let me know WHEN YOU NEED THE ORDER BY and WHERE YOU ARE LOCATED! 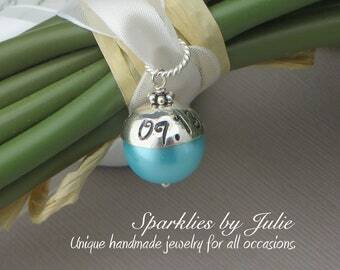 Bridal orders are fulfilled by the date you need your items by. If you place your order less than 4 weeks from the date you need the jewelry, there will be a $20 fee to expedite your order and you may have to choose a different form of shipping. If you fail to let me know where you are located and it turns out I have to upgrade your shipping method to ensure timely delivery, you as the buyer will be responsible for paying the shipping upgrade fee before items will be sent out. • For jewelry sets, shipping is $7.00 for the first item and $3.50 for each additional like item. • For everything else, shipping is $5.50 for the first item and $2.75 for each additional like item. • Shipping price is $14 for the first item and $6.50 for each additional item. Jewelry sets cost a little more. Please remember that shipping isn't just tossing your item(s) into an envelope/box, sticking a stamp on it, and walking it out to a post box. All my items will be beautifully & carefully packaged on home printed jewelry cards, in white jewelry boxes, and wrapped in bubble wrap to insure that it gets to you in perfect condition. Tracking comes standard on any packages shipped within the USA, and usually takes 2-5 business days to arrive depending on your location. The United States Postal Service does not always provide tracking on packages shipped internationally. Once it leaves the country, I may not be able to trace the package for you. It may take 2-5 weeks for international packages to arrive depending on location and customs. Please take into consideration that USPS shipping will most likely be a little slower around the holidays. If you need your items faster, please contact me for other shipping options. Once I've got it in the mail for you, I will email you to let you know it's on its way! If the post office loses or damages your item, please visit your local post office and report the problem. After that, contact me. I can either send a replacement (if available) or refund your money minus the shipping fee. I love hearing from my customers, however, please ONLY contact me via Etsy messages. It is the best way to reach me and I will usually reply within 48 hours. My current turnaround time is 5 business days (Monday - Friday) from purchase. Please note, this does not include shipping time, shipping is an additional 3-5 business days WITHIN THE US, and 2-6 weeks for international orders. Larger orders will usually ship 2 weeks from date of purchase, but I promise to do my best to get your order in the mail and on its way as soon as possible. If you need a rush on an order (meaning you need to receive something in less than 9 business days from date of purchase), please contact me asap, there will be a $20 fee for RUSH ORDERS and you may have to choose a different form of shipping! Most of my jewelry can be shortened or lengthened upon request. I do not charge for this service, as long as the adjustment is within two (2) inches. If you wish to add more than 2 inches in length, there will be charge of $0.50 per inch. Just leave me a note when you get to the Etsy Final Review, there will be a dialogue box for you to write me. Please be very sure of your sizes, as the order will be considered custom and therefore non-exchangeable or refundable. For a FIX-IT Fee of $20, I will fix any jewelry that you've purchased from my shop that has become damaged through regular wear and tear. Please contact me first, then ship the item back to me. Allow 1-2 weeks from date of receipt for me to fix it and then I will ship it back to you. I'll gladly work with you to create the jewelry of your dreams. Just contact me via Etsy messages. Let me know if there is any specific design you like from the pieces I've already created that you want to incorporate, your color choices, your material (glass, crystal, or gemstone, etc) of choice and desired jewelry length. If I don't have what you need on hand, I will try to find it for you, however, this will push the shipping date back by a bit. Of course! If you are interested in multiples of a specific item, please contact me first! I will then create a reserved listing for you that will reflect a discount on the price of the items. Please contact me to get more details and get a customized, reserved listing set up just for you! **Gift sets & Add Ons are not included in this deal as they have already been discounted. From time to time I do giveaways, would you like to be included? 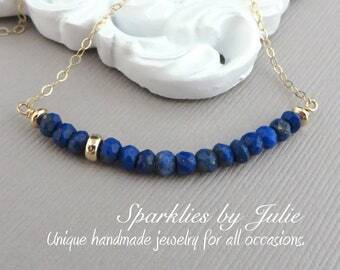 Like me on Facebook here: http://www.facebook.com/sparkliesbyjulie for chances to win FREE sparklies, get Facebook fan only discounts and a place to chat!